When it comes to developing our pneumatology, or our theology of the Holy Spirit, there has been much discussion on whether or not we can utilise the Gospel of Luke and the book of Acts to inform our understanding. Honestly, some have not been keen on the idea of utilising Luke-Acts, since they would see it as more descriptive rather than didactic (teaching doctrine). Such a group would see the epistles (i.e. Paul’s letters) as the primary didactic source for our pneumatology and the descriptive parts (such as Luke-Acts) as secondary in teaching doctrine. So, is it worth utilising Luke’s words in both his Gospel and Acts as a primary source for developing our theology of the Holy Spirit? Or should Luke’s two-volume work be seen more as a secondary pneumatological resource? An important thing to notice is that Luke stands as the only recorder of the early church and its history. Other Gospels (3 of them) had been written alongside Luke’s. But he alone holds a unique position as presenting early church history. It leaves us asking if his words should be relegated as secondary to the epistles or if they will give us a better understanding of the Spirit of God and His work. If we are honest with the text, and note Luke’s pneumatological purpose in his recording of early church history, Acts does stand as a vitally important theological work. And its significance is especially heightened when studied with its preceding volume, the Gospel of Luke, as Luke emphatically highlights the work of the Spirit in the life of Christ. So, whereas in the past, many evangelical theologians would have not seen the benefit of developing doctrine from narrative portions of Scripture, there has been a much great acceptance of such in recent years. This is a very important recognition, for we can definitely learn from narrative parts. We can learn just as much from God’s deeds as we can learn from God’s words. Even more, this inspired account of early church history is where theology and doctrine are being walked out in daily life. Thus, it carries importance. 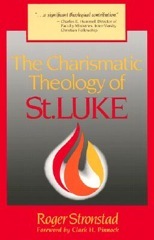 This is why I believe that Luke must be respected as both historian and theologian. Below are a few passages showing how we can receive instruction from the historical recordings of Scripture. Yes, it is definitely true that Luke presents a descriptive history of the church in his second volume, Acts. No one can argue with such. But, what we must be willing to recognise is that it is a didactic history at the same time. There is no doubt that Luke wrote to teach. He did not only write to describe, he wrote with a purpose to instruct us, just as the writers of old would have done with their narrative portions of the Old Testament text. Paul envisioned all parts of Scripture as God-breathed and useful for teaching. To say that certain portions of Scripture take precedence over others is not easily established from Scripture itself. What I mean with this subheading is that, many times, theologians will try and squeeze Paul’s specific theological emphases into Luke’s theology. Thus, we end up reading Luke through a Pauline lens, which is not at all helpful. Of course Scripture presents a harmonious whole. There is a unifying structure and nature to the entire text. But we need to give room for Luke to speak as Luke, rather than try and make Paul’s words fit into Luke’s words (or vice versa). For Luke is himself trying to teach us something about the Messiah, the mission of the church, the work of the Spirit, and a whole lot more. Let’s give this man room to teach us, even teach us apart from Paul’s own words. Not only that, but Luke utilises a lot of different phrases to describe these similar actions: the Holy Spirit came upon; the Spirit was poured out; the gift of the Holy Spirit; the Spirit fell on people; people received the Spirit. If we take all of these into account with regards to being baptised and/or filled with the Spirit, Luke has a lot to contribute on this topic. Our ears should be tuned to this man’s words. And just as a side note, another great work on how Luke should be viewed as not only historian, but also theologian, is I. Howard Marshall’s Luke: Historian & Theologian. As we look to develop a holistic pneumatology, consistent with the full text of Scripture, we must not forget Luke’s words and set them aside as only secondary to the words of Paul. Of course, we must also not pit Luke and Paul against one another, noting they were part of the same ministry team at times and are both within the canon of Scripture. But Luke’s words will, no doubt, enrich our understanding of the work of the Holy Spirit. All we must do is allow for them to teach us. This entry was posted in Acts, Holy Spirit, Luke, pneumatology and tagged Acts, Holy Spirit, Luke, pneumatology, Roger Stronstad. Bookmark the permalink.